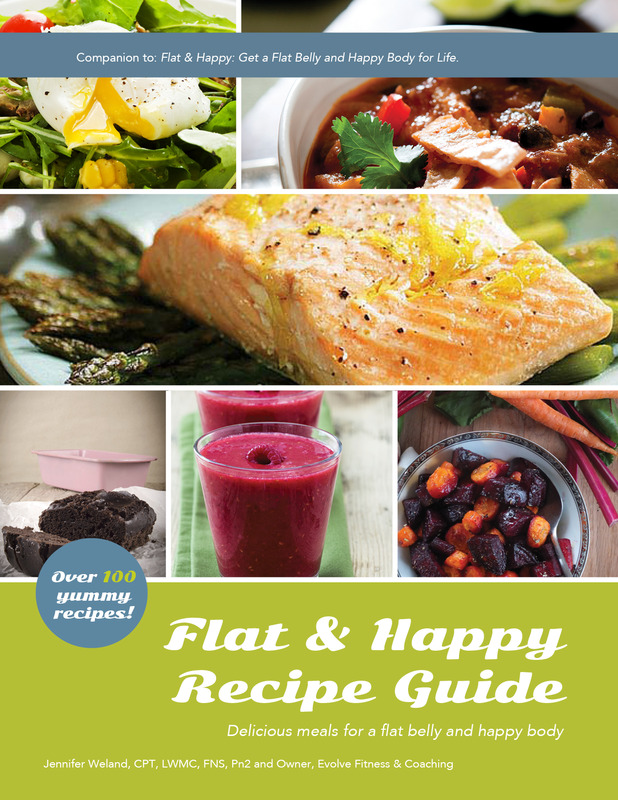 The Flat & Happy Recipe Guide makes it a whole lot easier to cook at home. I created this book because as a personal trainer, my clients were constantly asking me what I ate to lose fat or maintain fat loss. I started sharing some of the recipes I use and the tips and tricks I’d learned preparing more of my own meals and quickly saw the difference it made in their efforts toward better health and fitness. By choosing more whole foods and preparing more of their own meals, my clients had more energy, lost more excess body fat and looked and felt better. My goal for this recipe book is simple. I want to inspire you to cook. Why? Because the truth is, the more you cook, the better you look. Let’s get one thing clear from the start though—this is not about going on a diet. There are no “diet” foods here. Who wants to eat food that tastes like cardboard? Who wants to feel deprived? I certainly don’t! I know from years of experience, that the best success comes from not depriving yourself of wonderful food, but from learning how to prepare delicious foods that nourish the body. It’s usually cheaper. Restaurants typically mark up their offerings to 3 or 4 times what the raw ingredients cost. Plus, you have no control over the quality of those ingredients. Those take-out dishes could contain additives, extra sugar and salt or fats, or even genetically modified ingredients. You keep your stomach happy (and safe). It’s not rare anymore to hear stories about lack of food safety or contamination. By cooking at home, you control food handling, prep and the cleanliness of your tools and kitchen, so food-borne illness or contamination becomes much less of an issue. You get to spend more quality time with family and friends. Preparing and sharing home-cooked with friends provides more opportunity to connect over something positive and healthy. And, you could use that time to teach each other new recipes. You can be more self-reliant. If you have no idea how to cook, it leaves you pretty helpless, doesn’t it? Learning basic things and then branching out as you grow in skill and confidence will leave you less dependent on others—family, friends, the food industry, grocery store or restaurant industry to feed you. So why don’t more people make their own food? My clients tell me they don’t cook at home because: they don’t know what to make, they can’t seem to find good-tasting options that are also healthy, they believe they don’t have the time, or they don’t think they have the skills to make their own food. And while I can’t really teach my clients (or you) how to be more skilled in the kitchen, I can help with sharing good-tasting, healthy options that don’t take a ton of time and aren’t overly complicated. I could rhapsodize all day about great food and cheerfully spend hours browsing in farmer’s markets, at kitchen stores and talking with other foodies about great food. However, I know that not everyone shares this passion or has the time or energy to make elaborate meals. For those of you that would rather spend your time and energy elsewhere—this book will give you some clever ways to make your time in the kitchen both more enjoyable and less time consuming. With more than 100 yummy recipes to choose from, I know you’ll find things that are good for you and that you actually want to eat. Full-color PDF file with bookmarks to make navigating the recipe sections easy. Ideal option if you prefer digital to print versions of books. Want it on iTunes? Get it here.